"Do lead water laterals affect property values? A Case Study of Pittsburgh, PA, 2018"
Lead water laterals are the primary source of lead in drinking water in the U.S. Full replacements require both municipalities and property owners to agree to replace their portion. Line replacements are expensive to the extent that property owners may not feel the benefits of replacement are worth the costs. Improved understanding of how property owners make decisions regarding lead water laterals can help with mitigation, particularly when mitigation strategies involve providing public incentives for lateral replacement. This study explores whether the expected presence of a lead water lateral affects property sales in Pittsburgh, PA. Results indicate that lead laterals reduce sales values by approximately 5% (p-value = 0.079) or an average price reduction of $9,700 ($6,500 for a 2-bedroom home and $13,000 for a 4-bedroom home), which is consistent with casually understood cost estimates for lateral replacements. These results suggest that lead water laterals devalue properties in Pittsburgh. However, it is unclear if the estimated devaluation reflects price negotiations, buyers’ willingness to pay for lateral replacements, sellers’ willingness to accept lead exposure, a misperception of mitigation benefits, or a split incentive where buyers value more mitigation’s benefits due to a higher expected increase in residence time. Results do suggest that pending sellers could be good targets for programs providing incentives for lateral replacements in that incentive amounts beyond transaction costs would directly increase sales profits. Information describing buyers’ choices following a sale would be required to better estimate their willingness to pay for lead mitigation, and, should buyers follow a sale with lead mitigation, they could also be good targets for replacement incentives. The Pittsburgh Water and Sewer Authority (PWSA) provides drinking water for a majority of Pittsburgh’s residents. In late 2016, lead samples in Pittsburgh exceeded the federal action level. Since then, the PWSA, residents, and community stakeholders have worked to clarify the extent of lead exposure and formulate solutions to protecting public health. Lead water service laterals are the primary source of lead in drinking water. The water service lateral (or water service line) is the pipe connecting your home to the main water system. Ownership of lead laterals is split between municipalities and property owners. Municipalities own the lateral extending between the main water system and the shut-off valve located near the street curb. Private property owners own the lateral located between the shut-off valve and the water meter located on private property. While federal and state regulations require replacing lead laterals when elevated lead levels persist, communities face a number of challenges replacing them. Full replacements require both municipalities and property owners to agree to replace their portion. Line replacements are expensive, and the benefits to property owners are often unclear. If the benefits do not exceed the costs, private property owners are unlikely to participate. $15,000, depending upon the length and depth of the lateral and any restoration costs. Property owners may not properly understand why these costs vary and misestimate their replacement cost. Benefits vary demographically and are likely much higher in homes with expecting mothers or children under the age of 6. Private property owners also face transactions costs, or the time and expense incurred in participating in a replacement and any subsequent restoration. Transaction costs have been shown to limit engagement in energy efficiency opportunities, even when those opportunities are clearly profitable to property owners. Given the high transaction costs of a lateral replacement, property owners may prefer filtration, even if the long-term hard costs of filtration exceed replacement costs. The benefits and costs of a replacement may not be evenly shared, a situation referred to as a “split incentive.” Landlords and pending sellers would realize little to no health benefits of replacement lead lines, shifting the risks to renters and pending buyers. As a result, it is not often clear if and under what property-specific conditions the benefits of a lateral replacement exceed the costs. The State of Pennsylvania and PWSA recently made publically-funded full line replacements feasible. Granting municipalities approval to fully replace lead laterals is helpful. However, municipalities still need both the permission of private property owners and the resources to fully replace a lateral. In 2018, PWSA intends to replace 2,100 lead laterals, which covers roughly 10% of PWSA’s estimated inventory of lead service laterals. In the short-term, how do municipalities prioritize limited resources available for full line replacements? Potential replacement strategies include prioritizing at-risk populations, implementing a cost-effectiveness strategy, asking willing property owners to partially pay for replacements, or some combination thereof. The objective of this study is identify potential lead lateral replacement strategies by drawing on relationships between property sales and the presence of lead drinking water laterals. 2. Why study property sales? Why study property sales? Property sales and rental prices often reflect how people weigh a variety of property characteristics and nearby amenities. For example, people often positively value the size of the property, the number of bathrooms, proximity to transit, and the quality of public schools. They also often devalue high crime areas, unsafe conditions, and exposure to pollution. The net balance of these amenities is reflected (or “capitalized”) in sales and rental prices. By studying the relationship between real estate prices, property characteristics, and nearby amenities, analysts can better understand if and to what extent people value particular characteristics or amenities. In this study, we explore if and to what degree the presence of lead service laterals effects property sales values in Pittsburgh, PA and discuss the implications for replacement strategies. Property sales data from January 2012 to February 2018 were provided by Allegheny County . Excluding non-market sales (e.g., love and affection sales and auctions) and sales less than $1,000 and greater than $2,000,000, 3,622 market sales of residential property were identified. Property characteristics were also provided by Allegheny County . Property characteristics include floor space, lot size, counts of bedrooms, counts of bathrooms, occupant type (rent or own as indicated by a homestead tax exemption), and an evaluation of the property condition performed as part of assessing the property for tax purposes. Characteristics data were available for a total of 3,617 properties sold. A total of 99 properties were sold multiple times during the observation period. These properties were repeated in the sample. Model results were negligibly affected by the inclusion or exclusion of properties with multiple sales. Data describing service laterals by address were provided by PWSA . A notes field, historical fields describing the lateral material, and recent inspections were used to determine whether a lead lateral is expected at the property. Laterals were coded as either historically having lead or having no historical evidence of lead. PWSA has not perfectly maintained their historical data, so many records are missing and some inaccuracies are expected. Lead laterals were assumed present at the time of sale if any historical data indicated lead was present and no more recent information (e.g., inspections) indicated otherwise. Since there are incomplete records describing replacements, these data and respective assumptions may falsely indicate lead is present where it has previously been replaced. The replacement rate for the sample of properties sold is consistent with replacements observed for the overall service area (around 10%). Lateral material information was missing for 784 properties sold, which were dropped from the analysis. The final sample consists of 2875 market sales of residential properties in 63 of Pittsburgh’s 90 neighborhoods. Approximately half of the sold properties were estimated to have a lead drinking water service line. Figure 1 summarizes variation in prices by bedroom and expectation of a lead service line. Figure 1 indicates that the presence of a lead water line appears to decrease the median sale price for all home sizes except for those larger than 5 bedrooms. Figure 1: Sales prices of 2875 homes in Pittsburgh, PA between January 2012 and February 2018 by bedroom size and the expected presence of a lead water line. Assuming lot size serves as a reasonable proxy for replacement costs, Figure 2 explores whether the market 3 reflects variation in replacement costs. The fitted lines in Figure 2 diverge with increasing lot size, meaning that lead’s effect on price increases with increasing lot size. These results suggest that buyers and sellers may correctly perceive variation in lateral replacement costs. Figures 1 and 2 use descriptive statistics to explore whether the presence of a lead lateral might affect property sales values. Building on the insights from Figures 1 and 2, statistical models are developed to identify any more robust relationships between lead laterals and sales prices. Figure 2: Sales prices of 2875 homes in Pittsburgh, PA between January 2012 and February 2018 by lot size and the expected presence of a lead water line. Zero y-intercepts were forced into the fitted linear models. 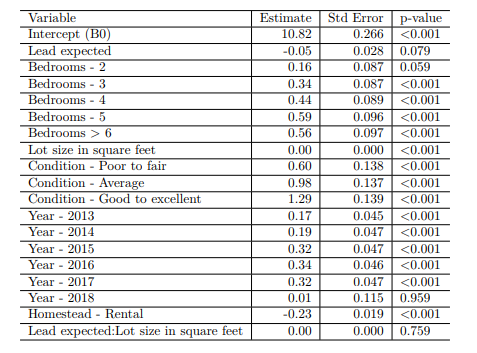 Linear regression models describing the sale price as a function of property characteristics, nearby amenities, year of sale, and the historical presence of lead were explored. Geographic descriptions include 5-digit zip code, neighborhood, and U.S. Census block group. Parameters were fit using ordinary least squares (OLS) estimators and selected using standard model diagnostics (error distributions, overall fit, and adjusted R2). Panel models were not feasible due to limited historical information describing lateral replacements. The selected model is described below, and Table 1 summarizes model results. Table 1 indicates that all selected factors are significant at the 10% level except year 2018 and the interaction between lead and lot size. 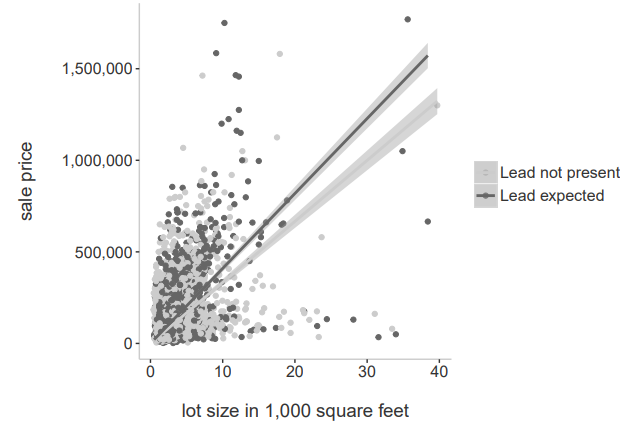 Thus, the trend observed in Figure 2 where lead’s effect on price increases with lot size is not statistically significant for the sample studied. The coefficient for expected presence of a lead lateral is -0.049456 and is significant at the 5% level (p = 0.079). Given the log-linear transformation, these results suggest that lead laterals are correlated with an average -4.95% decrease in sales price. Table 1: Summary of model fitting prices of 2875 homes sold in Pittsburgh, PA between 2012 - 2017 to property characteristics, year sold, location, and the presence of a lead water lateral. Model coefficients for neighborhoods are suppressed for clarity. 5. What do the results mean? Results suggest that the Pittsburgh residential real estate market values a lead-free water lateral. 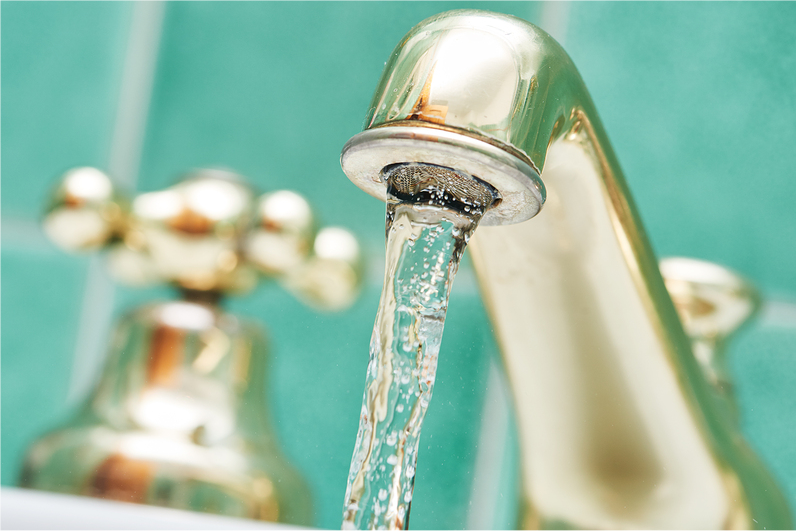 As a result of this awareness, buyers are either willing to pay more for properties served by lead-free laterals, sellers are willing to accept less for homes with lead lines, or likely some combination thereof. Readers should be sensitive to limitations of data quality and causality. Results indicate that lead’s estimated reduction in sales prices aligns with casually understood cost estimates for lead line replacements. This could but does not necessarily mean that the market values lead mitigation at its cost. Prior to finalizing a sales agreement, it is common for buyers to inspect properties, receive quotes for any desired improvements, and negotiate the sales price accordingly prior to closing. Lead’s estimated effect on sales could be the product of price negotiations or a reflection of a buyer’s willingness to pay for lateral replacements. More information would be needed to determine if buyers allocate savings from a price reduction to lead mitigation and better understand their willingness to pay. Challenges to causality are also apparent when one considers a seller’s perspective. Given the low replacement rate of lead laterals, sellers may be willing to accept lead exposure (or potentially misperceive mitigation benefits) in that they apparently do not value the benefits of lead mitigation above its costs. It could also be that buyers value mitigation benefits more than sellers in that sellers expect to occupy the home for less time than a buyer. Buyers may also have more children than sellers, and, as a result, realize more health benefits. Here again, more information - such as a survey of buyers and sellers - would be needed to clarify these circumstances. Table 2: Estimated reduction in sales prices from lead water laterals for 2875 homes sold in Pittsburgh, PA between 2012-2017. As public agencies weigh how to gain participation in full replacement programs, pending sellers may provide a good pool of participants. The results profiled here suggest that lead laterals devalue homes at an amount consistent with typical lateral replace costs. Thus any incentive amounts beyond transaction costs would directly increase sales profits. Finally, these results may help engage owners of rental properties, where line replacements are likely to be challenging due to tenant-landlord split incentives between the costs and benefits of line replacement. 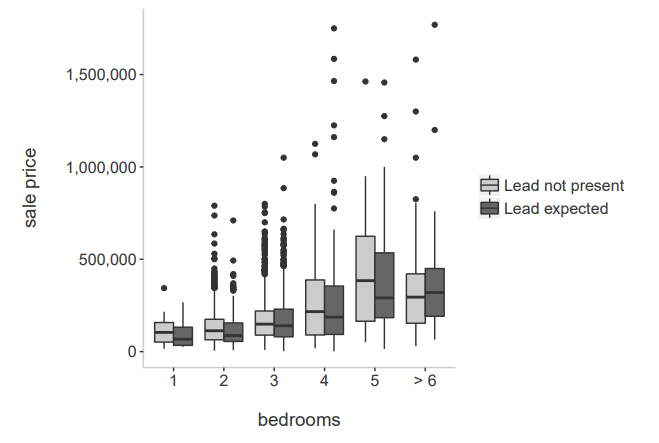 Absent similar market trends between rental prices and lead laterals (where data are missing), demonstrating a positive correlation between property values and lead-free laterals is likely a helpful strategy for engaging landlords with respect to replacing lead water laterals. Pittsburgh Water and Sewer Authority. Historical lateral material information obtained through a non-disclosure agreement between the Pittsburgh Water and Sewer Authority and the University of Pittsburgh. View a PDF version of this report here. View other Center for Social & Urban Research reports here.